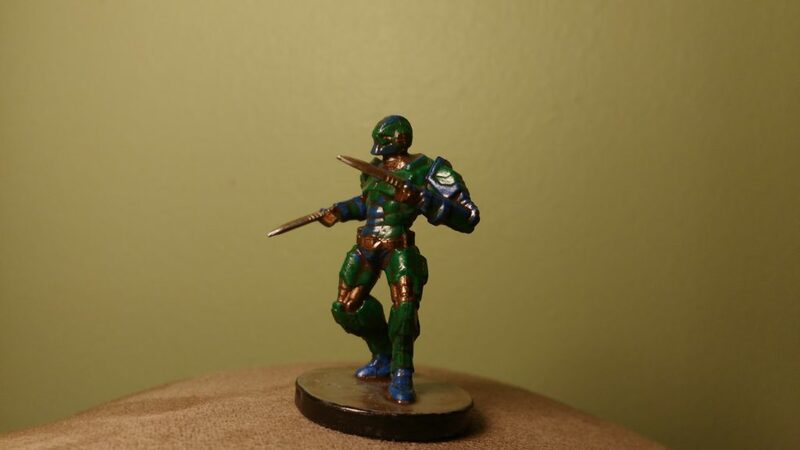 I plan to use the Enforcers from Mantic Entertainment’s Deadzone wargame as miniatures for playable androids in my upcoming Science Fantasy game. My first Enforcer paint job was on the conservative side so, with some consultation from my wife on the coloring, I decided to be slightly more adventurous with my second Enforcer. I did not use a primer this time around but painted directly onto the miniature. This allowed even the most minor details to show through. I mentioned in a previous post about how I’m learning the idiosyncrasies of the various materials I’m using and the DIP method is definitely one of them…after a dozen predictable results it suddenly drastically darkened this miniature. Remember how it didn’t do enough to darken poor Almaran the Gold? I think the devil is in the details and I’m going to check the consistency of the varnish after mixing from here on. Still, all things considered, I think that this one turned out alright.